†Daytrana® (methylphenidate transdermal system) provides long-lasting symptom control for up to 10 hours when worn for 9 hours-the recommended maximum wear time. When applied, Daytrana takes effect after 2 hours. Effects will last for up to 3 hours after being removed. Consult your doctor about early removal of the patch. Children come in different sizes. Daytrana® does, too. The once-a-day Daytrana patch comes in four sizes. 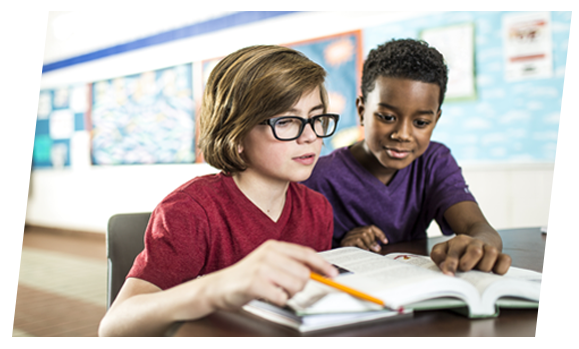 Each size delivers a different dosage strength designed to help manage the symptoms of ADHD in children ages 6-17. The suggested starting dose is 10 mg both for patients new to methylphenidate and for patients switching from another ADHD medication. To achieve the right results, the dosage may need to be gradually increased. Together, you and your doctor will find the right dose to help your child get the most out of the Daytrana patch. The patch provides up to 10 hours of efficacy when worn for up to 9 hours-the maximum recommended wear time. NOTE: Because the medicine in the Daytrana patch does not have to be processed through the stomach, dosage strengths may be different from oral ADHD medications. When applied correctly, the Daytrana patch should stay in place for the full duration of treatment. Exposure to water during bathing, swimming, or showering may affect how well the patch sticks, so be sure to follow the 6 steps below to ensure you apply the patch properly. 1. Carefully cut open the pouch containing the patch, and make sure it is not damaged. The patch should separate easily from the protective liner. Do not use patches that have been cut or damaged in any way. Throw away the patch if the protective liner is hard to remove. 2. Hold the patch with the protective liner facing you—the word "Daytrana" will appear backwards because you are looking at the bottom of the patch. 3. Gently bend the patch along the faint line, and slowly peel half the liner to expose the sticky surface underneath. Try to avoid touching the sticky part with your fingers. If you do touch it, wash your hands immediately after application. 4. Place the sticky side of the patch firmly on the hip and smooth it down. Make sure the skin is clean, dry, and cool without any powder, lotion, or oil. Alternate the hip on which the patch is worn each day to reduce potential irritation. Try not to use the same application site on either hip for several days. 5. Gently fold back the other half and slowly peel off the remaining protective liner. 6. Press the entire patch firmly into place and hold for about 30 seconds. This ensures good adhesion of the patch to the skin. Go over the edges with your fingers to make sure that it's well-placed and secure. NOTE: Wash your hands immediately after applying the patch. Patches should not be reapplied with bandages, tape, or other household adhesives. Also, do not use hair dryers, heating pads, electric blankets, or other heat sources directly on the patch. If you have to replace a patch that has fallen off, the total wear time for the first and second patch should not be more than a total of 9 hours in 1 day. Do not reapply the same patch that fell off. The Daytrana patch can be easily removed in 3 steps. 1. Peel the patch off slowly, then fold the used patch in half so that it sticks to itself. 2. Flush the used patch down the toilet or, if you have a septic tank, dispose of it in a lidded trash receptacle. 3. Remove any adhesive residue from the skin by gently rubbing the area with oil or lotion. NOTE: Any unneeded or expired Daytrana patches should be disposed of properly. Remove patches from their protective pouches, peel off the liners, and fold the sticky sides together. Then flush the patches down the toilet or throw away in a lidded trash receptacle. Proper disposal is important since unneeded or expired patches still contain medication that could be harmful to small children or pets if touched or consumed. This co-pay savings offer is only valid for commercially insured and cash-paying patients. This offer is not insurance. It is not valid for prescriptions covered by or submitted for reimbursement in whole or in part under Medicaid, Medicare, or other state or federal healthcare programs, including any state medical pharmacy assistance program. Pay as little as $20 for each prescription of 30 patches if your out-of-pocket cost is $100 or less. If your out-of-pocket cost is more than $100, you will save a total of $80 on each prescription of 30 patches. Offer valid for up to a total of 12 prescriptions of 30 patches. Offer limited to one use per month. Offer limited to one per person and is not transferable. The parties reserve the right to change or end this program without notice at any time. See offer for full terms and conditions. The Daytrana patch contains a prescription central nervous system (brain) stimulant medicine used to treat ADHD in children and adolescents 6 to 17 years old. Use of the Daytrana patch may help increase attention and decrease impulsive and hyperactive behavior. The Daytrana patch should be used as a part of a total treatment program for ADHD that may include counseling or other therapies. Daytrana is a controlled substance (CII) because it can be abused or lead to dependence. Keep Daytrana in a safe place to protect it from theft. Selling or giving away Daytrana may harm others and is against the law. Tell the prescribing doctor if your child has ever abused or been dependent on alcohol, prescription medicines or street drugs. The Daytrana patch should not be used if your child has been diagnosed as very anxious, tense, or agitated; has an eye problem called glaucoma; has tics (repeated movements or sounds that cannot be controlled); has a diagnosis or family history of Tourette's syndrome; is taking a monoamine oxidase inhibitor (MAOI) medicine or has discontinued an MAOI medicine in the last 2 weeks; or is allergic to methylphenidate, acrylic adhesive, or silicone adhesive. Tell the doctor if your child or a family member has any heart problems, heart defects, or increased blood pressure and heart rate. Remove the Daytrana patch and call the doctor right away if your child has any signs of heart problems such as chest pain, shortness of breath, or fainting while using Daytrana. Before you start using Daytrana, tell your doctor if you have circulation problems in fingers or toes. Tell your doctor if you have or your child has numbness, pain, skin color change, or sensitivity to temperature in your fingers or toes. Call your doctor right away if you have or your child has any signs of unexplained wounds appearing on fingers or toes while using Daytrana. Tell the doctor about any mental problems your child or family members have experienced including suicide or depression, bipolar illness, mania, or psychosis. Call the doctor right away if your child has any new or worsening mental symptoms or problems while using the Daytrana patch. Tell your doctor if you, your child, or a family member has a history of vitiligo. Be sure to tell the doctor if your child is pregnant or breast feeding. Serious side effects such as seizures (this usually happens in children with a history of seizures), painful and prolonged erections (priapism), slowing of growth (weight and height), persistent loss of skin color (chemical leukoderma) and eyesight changes or blurred vision have been reported with the Daytrana patch. Because of the potential for lasting damage, seek medical help immediately if you or your child develops priapism. Your child should have their height, weight, and blood work checked while using the Daytrana patch and the doctor may stop treatment if a problem is found during these check-ups. Allergic skin rash may occur. 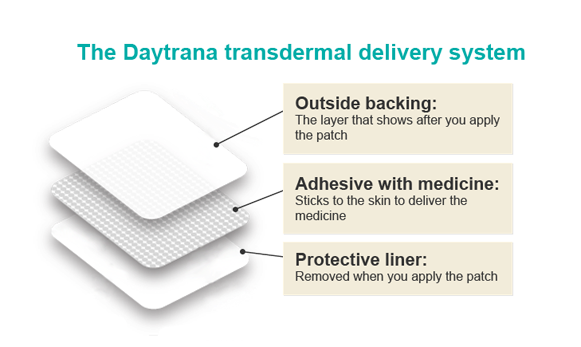 Stop using the Daytrana patch and see the doctor right away if swelling, bumps, or blisters happen at or around the site where the patch is applied. If the patch is worn longer than 9 hours in a day, or if more than 1 patch is worn at a time, too much medicine has been applied. Avoid exposing the Daytrana patch to direct external heat sources such as hair dryers, heating pads, electric blankets, heated water beds, or other heat sources while wearing the patch. Heating the patch could cause too much medicine to pass into your child's body and cause serious side effects. The most common side effects seen while using the Daytrana patch include skin problems (redness, small bumps, itching) where the patch is applied, poor appetite, nausea, vomiting, stomach pain, weight loss, tics, trouble sleeping, mood swings, and dizziness. Please read Medication Guide and Full Prescribing Information including the Boxed Warning regarding abuse and dependence. Daytrana® and the Graphic Design are registered trademarks of Noven Therapeutics, LLC. IMPORTANT: Daytrana is a controlled substance (CII) because it can be abused or lead to dependence. Keep Daytrana in a safe place to protect it from theft. Selling or giving away Daytrana may harm others and is against the law. Tell the prescribing doctor if your child has ever abused or been dependent on alcohol, prescription medicines or street drugs. Please be advised that Noven Therapeutics, LLC, has no control over the content or presentation of the site you are about to view. Click the "Continue" button to proceed. To return to Daytrana.com click "Cancel," or close this window. © 2014, 2015, 2016 Noven Therapeutics, LLC. All rights reserved.